This piece of cake from Prince William and Kate Middleton's wedding is set to sell for up to $2,000. You can now have a piece of Prince William and Duchess Catherine's wedding cake ... and eat it, too, thanks to an auction of royal family items on Friday. 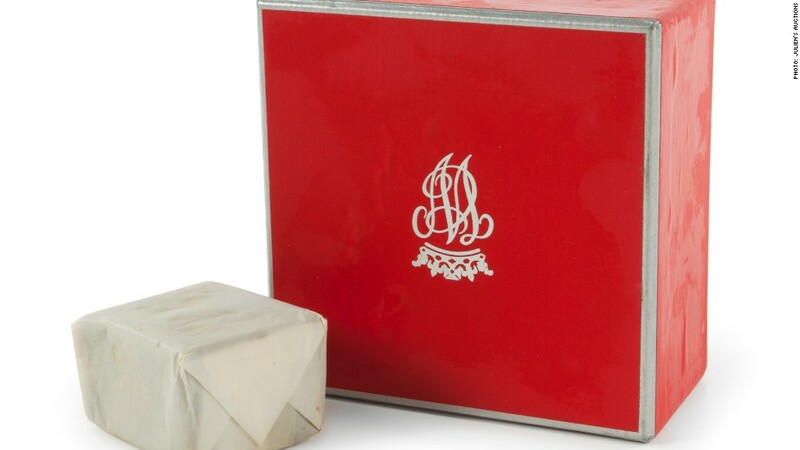 Julien's Auctions in Beverly Hills is putting up a slice of fruit cake given to guests at the royal wedding of Will and Kate in 2011, which one invitee sold to the auction house. The cake, which was eight tiers, took the baker five weeks to make and is said to peak in flavor 13 months after it was baked, comes in a tin along with a blank invitation to the wedding presented on the Queen's stationery. The auction house is expecting the cake to go for between $1,000 and $2,000. Several years ago, Julien's sold a piece of cake from the wedding of William's parents, Prince Charles and Princess Diana, for just over $6,000, according to the auction house's executive director Martin Nolan. The marital baked good was 27 years old at the time. Friday's auction will also feature five of Diana's dresses, which are expected to be auctioned off for between $60,000 to $100,000. Bidders will be gathered at the Beverly Hills auction house for the sale, set to begin Friday evening, but viewers can also tune in to a livestream -- or even place a bid -- on its website. But don't expect the dresses to be worn on a red carpet or even to a royal gala. Nolan said that they will most likely get swept up by a museum. "People still have a love affair with Diana, so they know these dresses will bring people through museum doors," he said.